>>> it will not be much of a celebration on capitol hill after being called out by president obama , the senate has now canceled its planned july 4th recess. but not before republicans fired off some choice words for the president. kelly o'donnell is nbc's capitol hill correspondent. kelly , good morning to you. >> reporter: good morning, matt. the summer heat must really be getting to them around here with more than the usual frustration in both parties over the debt limit showdown and more personal comments directed to the president from republicans . there's a kind of one ip about which party is working harder and acting more seriously. visiting a south philly favorite, the president ordered up a campaign style photo-op and a lemon ice. >> outstanding. i strongly recommend it. >> reporter: but that won't beat the political heat. republicans took offense at president obama 's swipe at congress for not working hard enough to solve the debt crisis. >> absolutely disgraceful. he should be ashamed. >> reporter: republicans made it unusually personal. >> i respect the office of president of the united states , but i think the president has diminished that office and himself by giving the kind of campaign speeches that he gave yesterday. >> reporter: jumping on the president's challenge, democrat harry reid canceled the july 4th break. >> we'll do that because we have work to do. >> reporter: and republican leader mitch mcconnell made his own offer. >> i'd like to invite the president to come to the capitol today to meet with senate republicans . >> reporter: to explain to the president directly that a deal with tax increases is doomed. >> we know what that position is. and he also invited them to hear -- invited the president to hear what would not pass. that's not a conversation worth having. >> reporter: republicans were so irked, kansas senator pat roberts suggested the president needed a pill. >> i think he should just take a valium and calm down and come on down to talk to us, it might be helpful. >> reporter: the president already had other plans. >> reporter: he attended campaign events expected to raise $2.5 million. republicans complained that the president had "lectured them" to cancel events. >> i'm here today though, mr. president. where are you? my understanding is the president's campaigning, has a fund-raiser in philadelphia tonight. >> reporter: and mitt romney , who is also campaigning in pennsylvania, joined in. >> the president ought to be in washington meeting with republicans , meeting with democrats. he shouldn't leave that town until he has an understanding of what it's going to take to get this economy going again. >> reporter: and another unusual twist -- republicans boycotted a senate finance committee meeting dealing with trade agreements they actually support. they said that they were tired of the white house "jamming them" with some last-minute additions that they didn't get a chance to thoroughly review. none of them showed up. it was quite a sight and a sign of how tough things have gotten. matt? >> kelly o'donnell on capitol hill this morning, kelly , thank you very much. 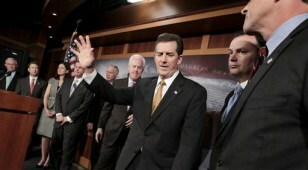 Sen. Jim DeMint, R-S.C., raises his hands to signal and end to a news conference on Capitol Hill, Wednesday, June 29, where he and a group of mostly freshman Republican senators said they want to forgo the holiday recess to stay in Washington and work on the debt crisis.